The Emerald Cut Diamond is one of the oldest and precious diamond shapes. With such a rich and vibrant history, the cut itself dates back to the 1500s. The word ‘Emerald,’ in ancient Greek word means ‘green’ which is where the precious gemstones, Emeralds got their signature name. However, these gemstones aren’t to be mistaken for the cut itself. Emerald gemstones are in fact prone to incursions, which made them vulnerable to fractures and other imperfections. As a result, diamond cutters found certain techniques to reduce this from happening and henceforth, the emerald cut was introduced. What is an Emerald Cut Diamond? An Emerald Cut Diamond is different to a regular cut diamond. Whilst most diamonds are brilliant cut which creates sparkle and and catches the light, emerald shaped diamonds are step cut, which means they reveal a lot more colour and clarity. With roughly 57-58 facets, the emerald cut often has a higher length to width ratio with a minimum ratio of 1.3 and a maximum of 1.6; not only does this make your finger look more slender but it also means the gemstone has a much larger surface area than any other diamond cut. This stunning 18-carat flawless emerald cut diamond is certainly a piece that would have been hard to say no to! Set on a double band, to emphasise the centre stone, the piece is simply flawless with an estimated worth of $5 million. If we weren’t already jealous of Beyoncé, we certainly are now! Mariah Carey’s whopping 35-carat diamond engagement ring will go down in history as one of the most magnificent emerald cut diamonds known on the market! Not only was it rumoured to be worth over $10 million but we can’t help but swoon at the sight of it. The central stone sat upon a white gold band that highlighted it’s brilliance. In 2011, Tony Parker proposed with this beautiful four-carat emerald cut diamond to the even more beautiful Eva Longoria. The stunning emerald cut diamond was also paired with two emerald side stones, designed by the amazing Jean Dousset and certainly drew the eyes of all those near. Although the marriage was short-lived, there's no doubt that Kris Humphries engagement ring to Kim Kardashian was absolutely stunning. With a total carat weight of 20.5,the ring was made up from a 16.5-carat emerald cut diamond as the central stone, with two trapezoids set either side. Not only is this design utterly unique but it also is the perfect blend of vintage and contemporary design. Fancy what you see? 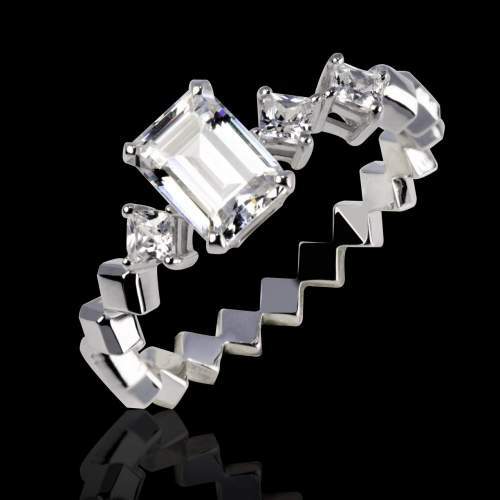 Take a look at our beautiful rendition of the magnificent emerald cut through our Elsa Diamond Ring. Paved with diamonds either side, this piece oozes elegance and class and is bound to be a statement piece for years to come. For our full collection of beautifully cut rings, visit our website for more.